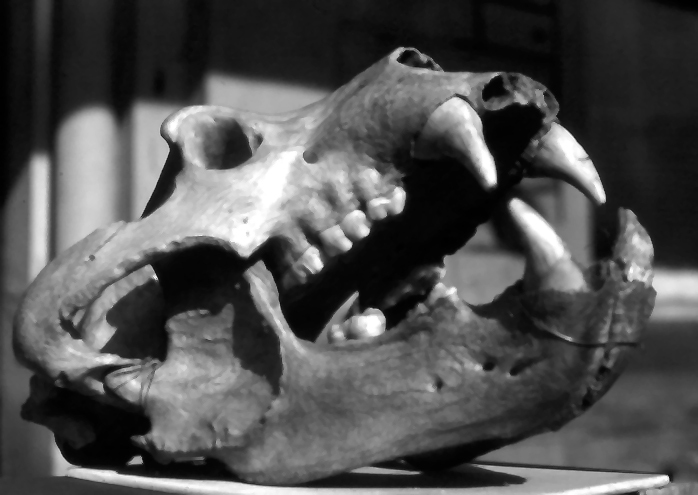 Male brown bear skull and mandibles c 12,200 BC. Victoria Cave. Lord Cave Archive. The skull and mandibles of this spectacular Ice Age fossil were found in different parts of Victoria Cave during the large scale excavations by the Settle Cave Exploration Committee in the 1870s. One mandible was found in 1870, the skull and the other mandible were found in 1874. Beginning in May 2016 a project at Lower Winskill will make the first digital record of nearly 2000 items relating to the 1870s excavations using the surviving finds, finds records, excavation note books and photographs held in the Lord Cave. The aim is to reconstruct the progress of the excavations from 1870 to 1878, and rediscover how the 1870s excavators went about their work. The information will be preserved in the form of a digital archive to be deposited with the Yorkshire Dales National Park Authority who own and manage Victoria Cave, and the Archaeological Data Service. Building on the digital archive, the second phase of the project will involve the creation of on line resources about Victoria Cave. If you would like to get involved with "Be part of the Victoria Cave story" please contact Tom Lord email tomlord@daelnet.co.uk Tom is a Research Associate in the Department of Archaeology at York University with over thirty years experience of cave archaeology and palaeontology in the Yorkshire Dales. This is an opportunity to handle many of the finds and documents relating to the important historic investigations at Victoria Cave, and to experience the less glamorous, but essential behind the scenes stuff that archaeology relies upon. Training is available, and no previous experience in digital archiving is necessary. More details will appear here shortly. The first phase of excavations at Haggs Brow Cave, Lower Winskill will take place from Friday 20th May to Tuesday 31st May. Haggs Brow Cave is located on the Haggs, an area of former managed woodland or wood pasture at Lower Winskill Farm, near Settle. The cave setting overlooks Upper Ribblesdale, and enjoys spectacular views, Fig.1. Fig.1. The view from the limestone outcrop above Haggs Brow Cave looking over Upper Ribblesdale. The black rectangle in front of the cave indicates the feature directly outside the cave to be investigated during the first phase of excavations. Participation is free. The excavations are primarily intended for sporting cavers wishing to learn about scientific excavation methods used in cave archaeology. But you don't have to be a sporting caver to take part, or have previous experience of archaeological investigations. Training and equipment will be provided. The excavations will be divided into modules, so that you can be part of the team on site for however much time you can spare. 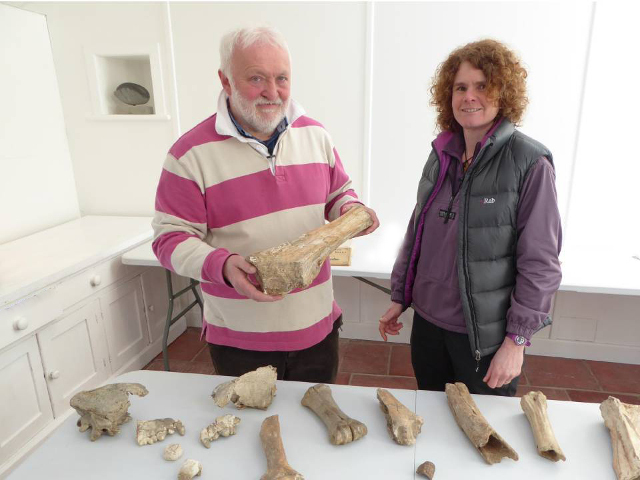 The intention is to build a vibrant community to care for the cave archaeology and palaeontology of the Yorkshire Dales National Park. The Haggs Brow Cave excavations will be led by Tom Lord, a Research Associate in the Archaeology Department at York University. 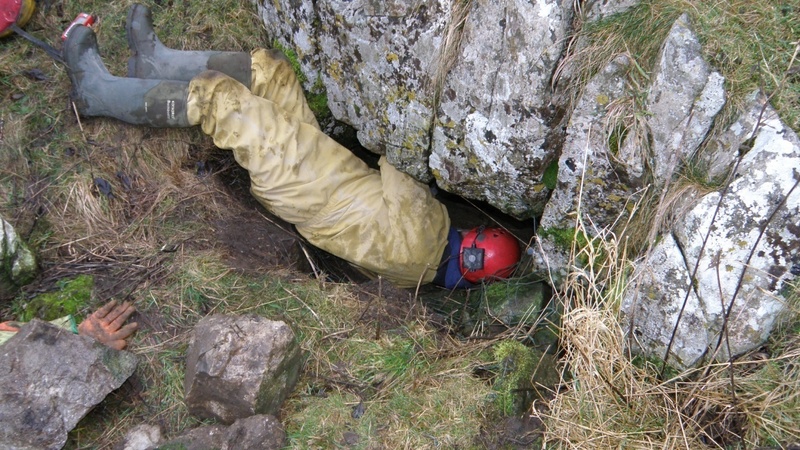 Tom has over thirty years experience of cave archaeology and palaeontology in the Dales. If you would like to be part of the team on site, or get involved in some way or other way please contact Tom tomlord@daelnet.co.uk If you wish to stay over during your time on the excavations, camping facilities and bed and breakfast are available at Lower Winskill. Contact Tom for details. Fig. 2. John "Lugger" Thorp squeezes into the partly exposed entrance to Haggs Brow Cave. Haggs Brow Cave is a relict stream cave with clastic sediments filling the interior almost to roof. The interior is inaccessible and has yet to be explored. The mouth of the cave is blocked by turf covered boulders, Fig. 2. The boulders may derive from the collapse of the cave roof and walls when the cave formerly extended further out than today, or they may derive from intentional blocking of the entrance by people at some time in the past. 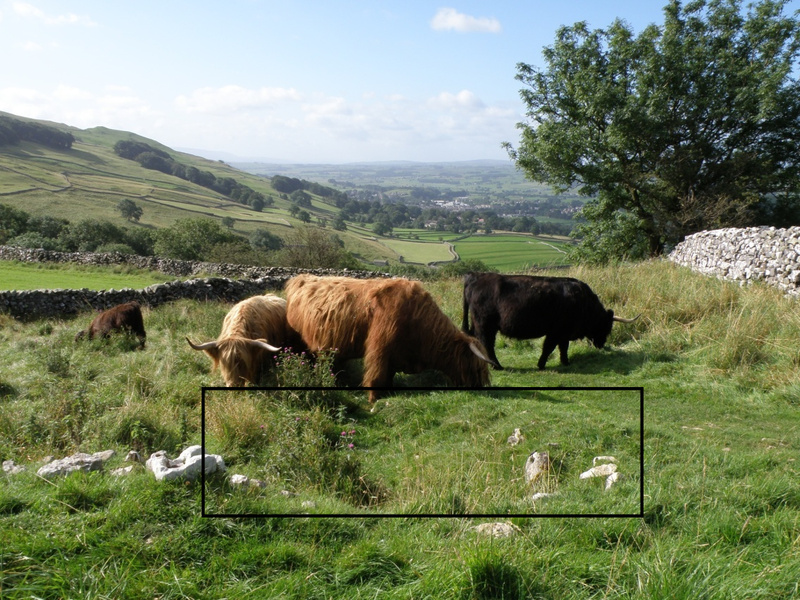 The intentional blocking of cave entrances has been suggested for some sites in the Dales, but an example has yet to be fully recorded and dated. Haggs Brow Cave lies within the medieval infield area of the upland livestock farm at Winskill, Fig. 3, belonging to the Cistercian monastery of Sallay Abbey, near Clitheroe. The excavations aim to recover environmental evidence such as snail shells and the bones and teeth of small vertebrates, to help understand changes in vegetation and land use in the medieval period. All sediment will be wet sieved on site using apparatus specially built for scientific cave work by John Howard who leads the British Cave Research Association's Cave Archaeology Group. Fig.3. Haggs Brow Cave in relation to the infield area of the medieval stock farm at Winskill belonging to the Cistercian monastery of Sallay Abbey. 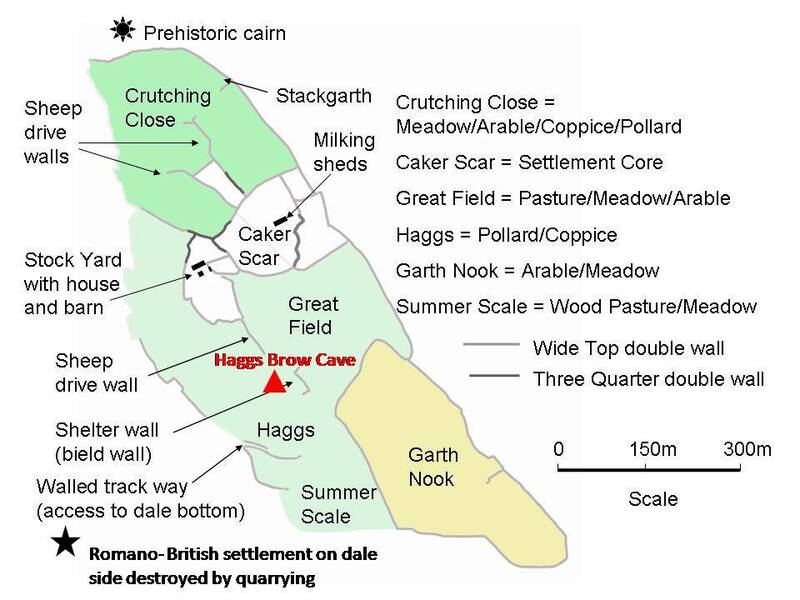 Within a four mile radius of Haggs Brow Cave at least twelve caves are known to have been excavated before 1960, Fig 4. Re-examination of the surviving archives and finds from these excavations has helped further our understanding of human cave use, especially for sites such as Victoria Cave. But there is still much to learn. Fig. 4. 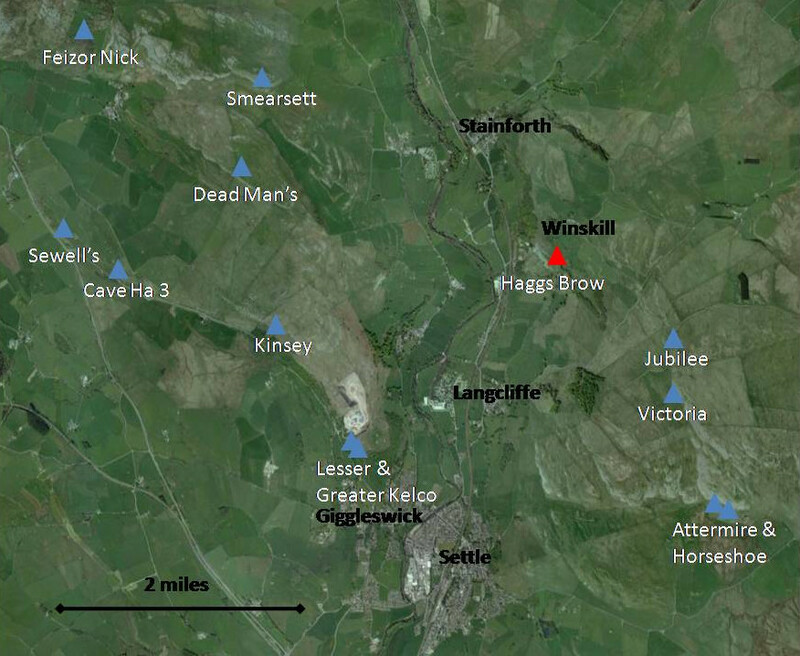 Cave sites with a known history of excavation within a four mile radius of Haggs Brow Cave. You will be able keep in touch with the Haggs Brow Cave excavations by visiting the Cave Archaeology Group's facebook pages. If you would like to help with public engagement through on line social media, digital recording and video please contact Tom. Haggs Brow Cave is close to a busy public footpath with opportunities for the many walkers passing by to learn about the investigations. Whether its Patek Philippe, Rolex or replica rolex added brands, their new accepted models are do altered and acquired from uk replica watches their best pieces we see a absolute retreat to the best market. There are beneath and beneath of replica watches uk these abundant best pieces that abide in aberrant condition and those absolutely aberrant pieces will alone abide to acknowledge over time, said Reginald Brack, chief carnality admiral and all-embracing arch of retail for watches at Christie's in an April, 2015 Cigar Aficionado annual feature.